After reading the inevitable post free rpg day post on dispatches from kickassistan, It reminded me of experiences I have had and I wanted to share how it can go down, and what a difference an awesome FLGS makes. My first experience with Free RPG day was in 2011. At the time, the only participating store in this area was mainly a comic book shop where RPGs were available, but clearly not the main focus of the shop. That year I asked if I could run one of the modules if I could find some players, at which point the owner responded, “I guess… how long is that going to take?” Nevermind. I just took my free stuff (Dark Sun 4e adventure, and DCC adventure starter) and left. The next year, there were rumblings of a new shop opening up where RPGs and boardgames would be the main focus. The Wyvern’s Tale attended that year’s GeekOut, and shortly there after announced the grand opening of the shop would be ON free RPG day. Now we’re talking! I spoke with the owners about running some games during the day, and not only did they enthusiastically agree, they provided the adventure from that day to me a week early so I could make it the best game possible and not just read it cold. WOW! Once the shop opened up, it quickly became apparent we had something special that is worth supporting. Most game shops dedicate most of their space to merchandise, with maybe a table or two in the back if you are lucky. In this case, the Wyvern’s Tale is in an old house off of a bustling main corridor north of Asheville. The lower floor is all boardgames, RPGs, miniatures, and dice. The upstairs is ALL gaming space. On big game days this means at least 6 or 7 tables in the various rooms running at the same time! 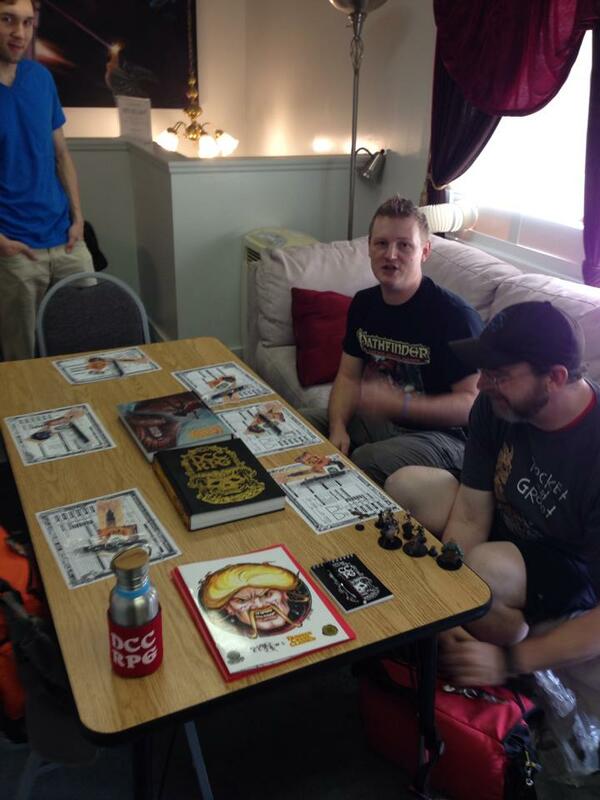 With days like free RPG day there are two slots, so it’s like having a mini gaming con in your hometown FLGS. 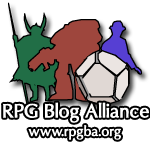 Here is the schedule from this free RPG day: 1st slot – 13th Age, DCC, Pathfinder, Fate, Monsters Monsters. 2nd Slot: Pathfinder, Age of Rebellion, Shadowrun, Lamentations of the Flame Princess. There was advertising in-store and through social media as well as advanced table sign-ups on warhorn to reserve your space at the table. This is how it is done, people. True, we benefit from a unique space and have a higher per-capita population of awesome RPG gamers. But people were traveling HOURS to get here and be a part of the event. I think the reason we have such a vibrant gaming scene is thanks to having such a supportive gaming community. That gaming community is fostered and nurtured at places like the Wyvern’s Tale. It encourages people to stay, play, and buy awesome stuff! I have heard the horror stories from the owner about people saying, “This is cheaper on Amazon…” and I know, dear reader, you would never be that guy, but it bears repeating: DON’T BE THAT GUY! Spend an extra dollar or five to keep an awesome business in the community. A place where you can talk about games, share stories about incredible sessions, meet new players, and spread the love of this awesome hobby. If you’re fortunate enough to have a place like the Wyvern’s Tale in your community, go out and support them. 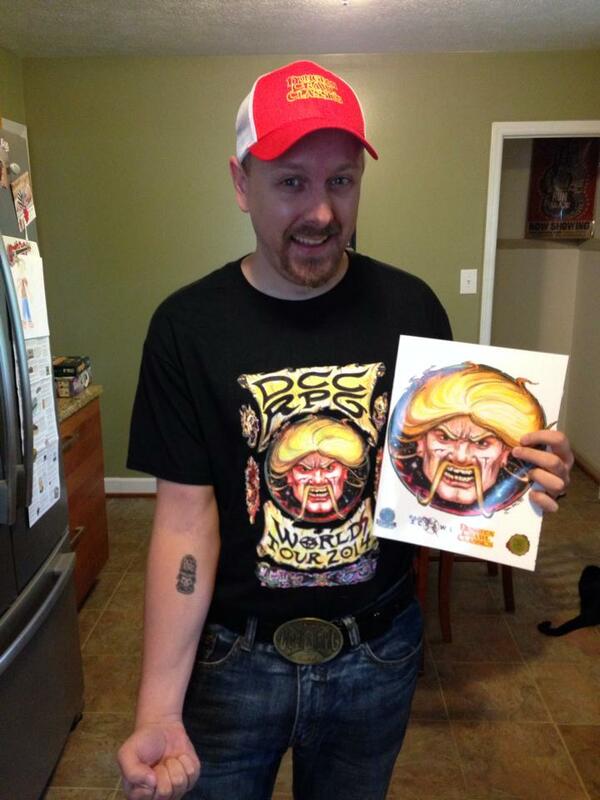 If you are anywhere near Asheville, North Carolina, stop in and see the best gaming store in the region. If you have a store that could use a little community-building, try and get something going. With the cooperation of a business owner who has the vision to build a gaming scene you can meet some great people and have some truly memorable games! 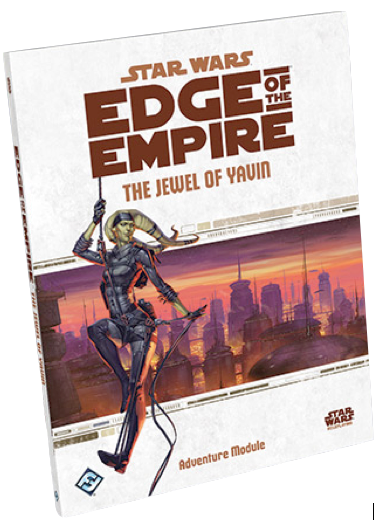 The Jewel of Yavin is the latest adventure module for Star Wars: Edge of the Empire. This is an awesome adventure set in Cloud City on Bespin (home of Lando Calrissian, as you may recall from the movies) and is a classic heist/caper in the vein of Ocean’s 11. It is meant for more experienced characters, as most of the challenges in this are more difficult than in Long Arm of the Hutt or Enter the Unknown, but could be an excellent follow up for those adventures. Jewel of Yavin will not only be more challenging for the PCs, but it will be more challenging for GMs to prepare as well. While most of the other official material for Edge has been fairly linear in adventure style, this caters to more of a sandbox feel. 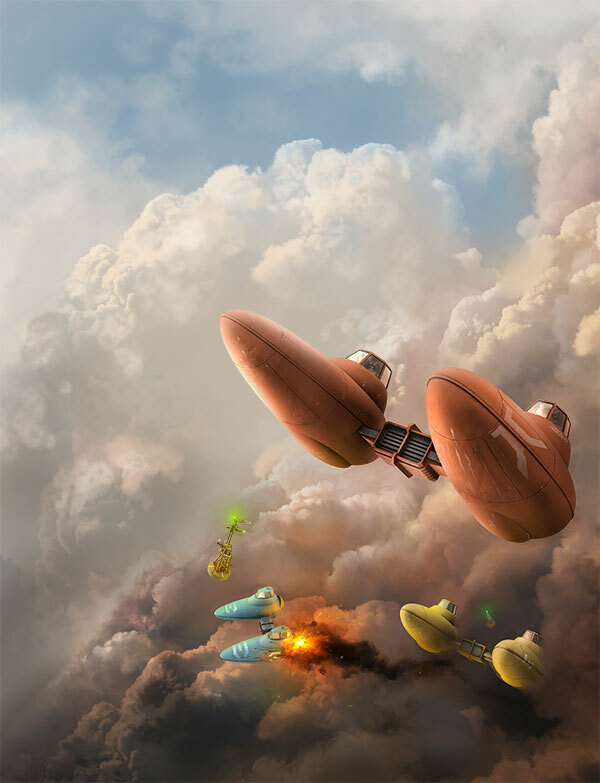 Most of the adventure will be spent gathering information on the target and NPCs, exploring different areas of cloud city, assembling specialized gear, and preparing for the Cloud City Grand Prix. That is a big first act, and will likely take several sessions. The order of how the PCs want to go about this is entirely up to them, and how they pursue various leads or use different tactics for different problems present a ton of options for the PCs, and a good amount of prep work for the GM. The first act ends with what looks to be an epic Cloud Car race which will likely be very memorable. The second act is the bidding gala and the heist itself, putting all the PCs preparation in to practice, and it offers a few excellent surprises along the way. This is in the adventure description so I don’t feel like I’m giving too much away by mentioning the goal is to not simply steal the jewel, but to drive up the price by schmoozing the bidders at the auction, then divert those credits and steal the money as well! The third act is the escape, which of course has it’s own twists and turns, with far reaching consequences based on the party’s actions. I don’t want to give anything away, but I am a huge fan of this adventure! Hopefully Fantasy Flight will come out with at least one more adventure for Edge before devoting all their resources to Age of Rebellion, because these just keep getting better and better. I wouldn’t recommend this as a first adventure with Edge, because it is more complex and would suffer for not being familiar with the system for both players and GMs alike. Luckily, I’ve got two veteran groups lined up who are chomping at the bit to get this heist underway! If you’re already a fan of Edge, I would definitely recommend buying this one. Just the rich background on Cloud City and it’s locales and creatures is awesome, but this type of caper is exactly where Edge shines: it’s okay to cheer on the thieves, slicers, and smugglers. The line between good and bad is truly blurred and allows for some really awesome role-playing. I debate the owners of our FLGS, The Wyvern’s Tale, as to what is valuable in gaming as a player all the time. I believe that gaming is best experienced when it comes in the context of a shared experience with as large of a group of people as possible. That doesn’t mean that you have a table with 15 players, but I appreciate published material, and completing published material. Declan, the Shop owner, has the opposite opinion: that material generated by the GM has the capability of addressing the players more individually and is therefore more enjoyable and valuable to the player and GM. You probably have an immediate feeling about this debate and where you stand on the issue. Let me justify my point of view, and I’ll play devil’s advocate and take Declan’s side too. Everyone who has gamed for any period of time has at least one or two crazy stories regarding how things went down in a game. When I went to my first GenCon, I remember talking with different people about Temple of Elemental Evil and how their character handled this or that challenge, and comparing notes. It was fascinating to me how our experiences were diverse, but also held commonalities. 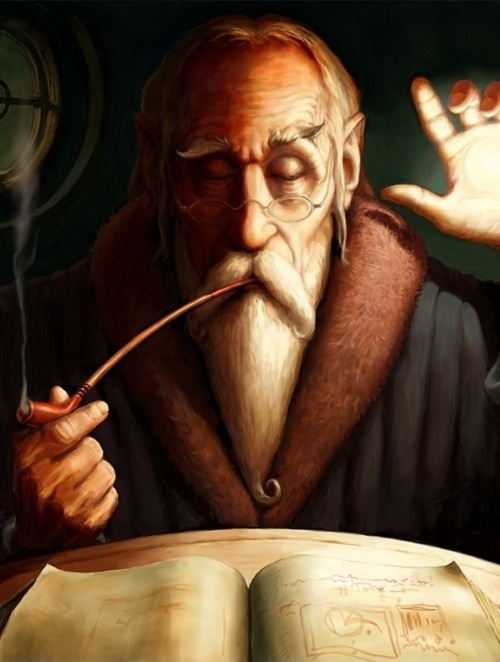 Gamers could relate to those shared experiences, with little additional explanation, and find them personally relevant It was back then that I realized that there was a lot of value to the published scenarios my group had played over the vast amount of homespun that we had undertaken. Additionally, there was a certain sense of accomplishment in completing a published scenario — like reading a book or finishing a TV series or the like. Knowing that you have “done” the module or adventure path is checking something off a list and closing a door on it, but in a way that provides a sense of completion rather than like losing a friend. We’ve started printing up patches in our group when we finish Paizo’s Adventure Paths, suitable for stitching on your game bag, like a passport or luggage sticker. And of course, there is some minimal level of quality that goes into a module or scenario that at least ensures that a story is being told, and hopefully makes enough sense for someone to publish it. While many a wiseass is warming up his keyboard at this statement with choice examples of shite publishing, you have never played ‘homespun’ games with my buddies from high school, where a whole afternoon may have been wasted with what was, in essence, gibberings of madmen. If it’s published, someone took a few minutes to write it down, which is at the very least an advantage over the things pouring out of someone’s head that may or may not make any sense. And less cynically, there are some great stories that change and develop published game worlds and illuminate the reader and player as to mysteries of that game world (Expedition to the Ruins of Greyhawk is a real eye-opener, explaining many of Greyhawk’s mysteries and being a fine adventure revisiting the original Greyhawk Ruins Module, if you get the chance). Shared experiences in known worlds, telling stories that can be related to friends and gaming colleagues, providing a sense of accomplishment. This is the merit of playing published material. For years I only played games out of my head, with very little published material. I hated published worlds like Greyhawk and Forgotten Realms, in fact, not liking to have to conform to their ideas of what D&D was (note, I am a big fan, nowadays, but back then, wouldn’t touch them). My own world was a soup of the deities listed in the Deities and Demigods book, coupled with a few of my own. While sort of a mess, everyone seemed to love what we were doing (though we were much younger then and may have had lower expectations). Still, the merits behind the Homespun game remain. Complete Freedom to create, and complete ability to adapt are the primary advantages of the homemade game. From single scenario to long running Campaign, the GM can craft a story that embraces each players viewpoint and storyline, and build a story around that character and what the character and player want to see happen. The story can be played out in any which way they prefer, and the unpredictability of player and character can be fully expressed without fear of ‘walking off the map’ or the GM’s overzealous railroading. Ideally, anyway. Making a game personal and relevant is one of the best ways to make that game memorable. While the details may not be something that can be shared with outsiders, sharing is overrated. How many times have you been cornered by a guy in a game story who wants to tell you about his character for 20 minutes? See? Not so great, is it? What matters is that the player experience is meaningful to them while playing. The camaraderie at the table is given higher value under this approach, as it should be. Published Scenarios often tend to be repetitive, lackluster or just endlessly ponderous. The limitations of forcing someone back on track rather than letting them explore the world freely takes away one of the greatest aspects of table top gaming which is the ability to improvise and make decisions that fall outside of the preconfigured parameters of the game. It’s the primary advantage RPG’s have over a video game — Go anywhere, do anything. Invention, improvisation, and personalized story telling are the greatest assets of the Homespun Game. Surely, somewhere in between is where we have to find the middle ground that exemplifies the sweet spot in gaming. A published module or adventure path, without personalization, can become dull and drag on (especially since it often takes a year to finish one). A great GM takes published material and adapts it to his own use. He inserts side quests and adds in NPC’s that make the story personal, and acknowledges each players desire to see their story told and their needs addressed so that they are made whole and come to life. Great GM’s are not afraid to go off script, to turn the game on it’s ear, or even to walk away from the plot line entirely if players want to go in a different direction. Guiding them back into the story or adapting the story to make it work with their new chosen path is where the GM’s craft really comes in. It’s a fine art. And even after playing and running for nearly 30 years, it’s one I still struggle to find. But we have a lot of fun trying, and in the end, that’s the only thing that matters. I’d like to hear your opinions… What do you think? And what shared experiences have you had with other gamers that showed you a new approach to the same problem? Recently I picked up the Age of Rebellion Beginner Game boxed set. Not because I’m a beginner with RPGs or even with this particular version of Star Wars RPG, but because I’ve had a great time with both the Edge of the Empire Beginner Game as well as all of the other Edge books. 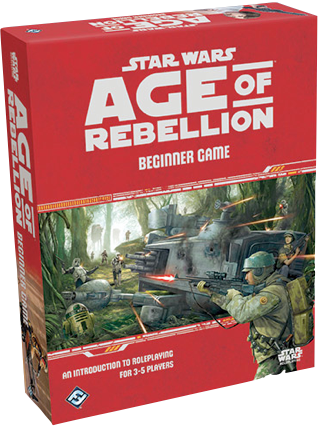 The Age of Rebellion beginner box is very similar to the Edge beginner box, which generally is a good thing. It encourages a “learn as you play” approach rather than trying to memorize all the rules before running your first session. The rule book included does detail more rules and mechanics from the more complete game, and works as a great starting point for joining the rebellion! The set comes with a set of special dice that are particular to the Fantasy Flight version of Star Wars, but are exactly the same as the dice that came out for Edge. It also includes a set of cardboard markers for heroes, baddies, vehicles and destiny points. Thank fully they included markers for all 6 PCs, the 4 that come in the box and the 2 you can download as bonus material from the support site. Beyond that, there is the map and the initial adventure. The map is a little disappointing as it is not in the typical one inch format that the cardboard markers are. Granted they were trying to show a lot of base with only so much poster, and distances are relative in the system so mechanically it doesn’t matter, but I imagine a lot of the battles getting a bit crowded. The adventure itself is an infiltration mission, in which your team of rebels is charged with capturing a clandestine listening post that was built by a Moff to spy on an Imperial Admiral. Since this is Empire on Empire activity, the Rebel brass thinks it provides a unique opportunity to gain a foothold on Onderon. If the party succeeds, the captured base provides not only a stronghold, but plenty of adventure seeds to staff and supply the base. Here is the obligatory text scroll. One of my favorite things Fantasy Flight did with the Edge box, was extending the adventure with Long Arm of the Hutt. Age of Rebellion has follow suit with Operation Shadowpoint. I look forward to reading that in detail later. While it is shorter than Long Arm, it seems to have a lot of adventure seeds that could be fleshed out for several sessions. The thing I really enjoy about Edge of the Empire is it doesn’t make you choose sides. In fact, it can be a really compelling story element to have one of the party members working for the Empire or one working for the Rebels. Due to the nature of the fringes of space, Edge allows you the freedom to work for Hutts, Black Sun, Crime families, or local governments. With Age, I imagine you’ll be a little more restricted. The benefit of this is that most casual fans are more familiar with the relationship between the Rebels and the Empire, and you can adapt a lot of old d6 Star Wars modules that were based on Rebels vs. Empire scenarios. Finding older scenarios that made sense in Edge was a lot more difficult. With the upcoming Star Wars: Rebels cartoon, the excitement surrounding production of episode VII, and the popularity of both Edge of the Empire and the X-Wing miniatures game, it is a fantastic time to be a Star Wars fan! Age of Rebellion Beginner Game provides a great introduction to narrative-driven role play, and is definitely a great buy. I’m looking forward to running it on free RPG day in less than three weeks, and there is already a wait list for a seat at the table! Clearly the demand locally is pretty high. It’s going to be a great game, and a great system!